Do you want to know how to build a team? Look at teaching in God’s Word about unity within the Body. 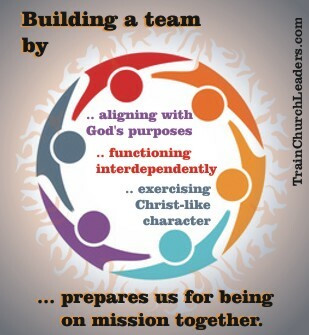 Philippians 2 provides essential components for team building. The first point, aligning with God’s purposes, comes from the “if … then” statement in verses 1-2. In Christ we stand united but the state of our unity with one another doesn’t always match our standing in Him. “If” teams are going to experience “any encouragement” from the unity they have in Christ, “then” they must be “like-minded” so who they are in Christ becomes what they do. For the “same love” to unite us, it must be agape, the Greek word used in this verse. Trying to unite around a friendship sort of love too often brings failure in team building. Team camaraderie must be built on and around God’s love, divine not human love. Then we can come together as a team even when we disagree. We can even work with those we might consider “sand-paper” type of people who tend to rub us the wrong way. Leaders, help team members learn to first and foremost love God but also to love one another as Christ loves us (Jn. 13:34). In building a team, focus on the heart, not just the task. 2) being one in spirit and of mind. Certainly like-mindedness must go beyond agreeing on every issue. Oneness must be based on something higher, like God’s purposes. Teams must come together on what God values most, on what lines up with Him. Anything short of following His purposes and will has the potential of moving into the politics of personal agendas. Leaders, work at getting the team on page with God, not agreeing with one another. Team building must include praying together and seeking to know God’s heart and ways as your primary criteria in moving forward as a team. I love the idea of team building for GOD lovers and the real word followers, for the most part. It is definitely a blueprint for new upcoming faith-based small startup churches. Yes, Ray, as God lovers we become God followers (Jn. 14:21). His blueprints are always best — better than what we would come up with on our own (Isa. 55:9).